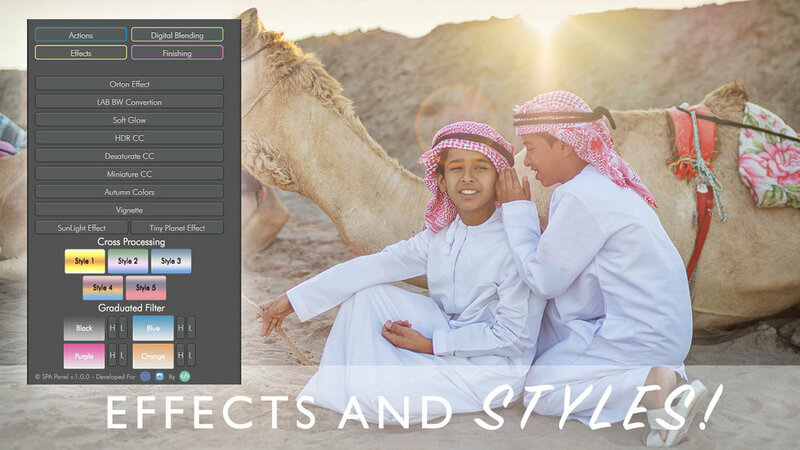 The SPA Plugin is created for Photoshop CC to CC2018 and newer and is suitable for Mac and PC. Customized for easy reach and easy to use, with 4 windows, each window will give you powerful controls and actions on your images, we covered all the ways to enhance your images and create a masterpiece, most of the buttons are having either a smart filters, smart layers or non destructive method so the original images stays originil! Having all the methods that available to do correct exposure blending is a blast! you can create a natural HDR looking image with a click of a button, and no need to remember all those strange or difficult steps. In this panel you can align, focus stack, create luminosity masks, and blend. Two things has been used in the image, First is the Frequency Separation method the can be located in first tab ( Actions ) its one of complex retouching method, but with this Panel its mater of clicking in a button and drawing with brush on the face and get all those nice and smooth details you always want to have! second thing used here is the Brighten Eyes actions to have those eyes pops, you have full controls of the layers to get it 100% right. Create high contrast BW image is easy in photoshop, but if you create it using LAB mode, with the action called: LAB BW Conversion in ( Effects ) it will generate much different and more its graduation of grey is much better and smoother. as the LAB only and mainly focusing on the lights and not the colors. Forget all those un-natural effects your real photographs, Photographers require clean looking effects with minimum affect, And best of all those are controllable and fully editable to do it in your own way! Producing that common sunlight in photoshop never been easy, just choose the Effects Tab and then Sunlight effect, and Voila! also to enhance that red color on the grass you can use the Autumn colors actions, and you're done! Wether you have dark image, or bright image, SPA will have something for you! using Restore Shadow in Actions Tab is super easy and will give you fabulous results, and combining that with A bit of Cross processing effect ( Effect #5 used) you will get something unique and you'll save that dark photo you got!